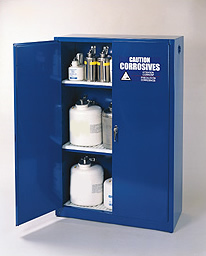 Based on the ultimate size of the acid & corrosives storage cabinets selected, from 4 gallons to 60 Gallon capacity cabinets are available. All interior and exterior surfaces, including shelves, are finished with blue epoxy powder coating. Special corrosion resistant powder coated finish on all interior and exterior surfaces, including shelves, offers the customer an excellent protective storage vechile for acids and and other corrosives. Powder coating gives superior protection against chemical attack in event of a spill or splash. 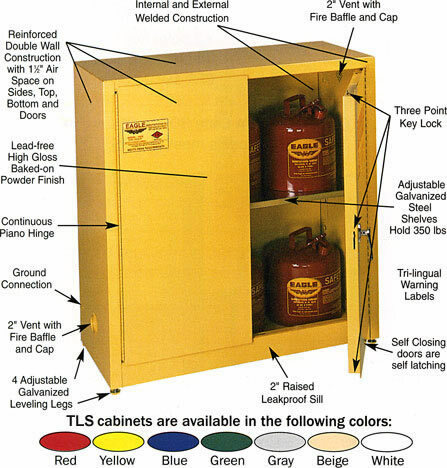 For additional protection, each cabinet is supplied with high density polyethylene trays for the shelves and bottom of cabinet. are suitable for use with these acids. CRA-1903 4 gal. - 1 Self-closing 17.5"x18"x22.5" 80 lbs. CRA-1904 4 gal. - 1 Manual 17.5"x18"x22.5" 80 lbs. CRA-1924 12 gal. - 1 Self-closing 23"x18"x35" 135 lbs. CRA-1925 12 gal. - 1 Manual 23"x18"x35" 135 lbs. CRA-1915 15 gal. - 2 Manual 43"x18"x22¼" 148 lbs. CRA-1905 16 gal. - 1 Self-closing 23"x18"x44" 150 lbs. CRA-1906 16 gal. - 1 Manual 23"x18"x44" 150 lbs. CRA-1923 24 gal. Y 1 Manual 23"x18"x65" 270 lbs. CRA-2310 24 gal. Y 1 Self-Closing 23"x18"x65" 270 lbs. CRA-30 30 gal. Y 1 Sliding 43"x18"x44" 259 lbs. CRA-32 30 gal. Y 2 Manual 43"x18"x44" 259 lbs. CRA-3010 30 gal. Y 2 Self-Closing 43"x18"x44" 259 lbs. CRA-45 45 gal. Y 1 Sliding 43"x18"x65" 353 lbs. CRA-47 45 gal. Y 2 Manual 43"x18"x65" 353 lbs. CRA-4510 45 gal. Y 2 Self-Closing 43"x18"x65" 353 lbs. CRA-1926 55 gal. Y 2 Manual-Vertical Drum Cabinet 31¼"x31¼"x65" 350 lbs. CRA-2610 55 gal. Y 2 Self-Closing-Vertical Drum Cabinet 31¼"x31¼"x65" 360 lbs. CRA-1928 55 gal. Y 2 Manual-Horizontal Drum Cabinet 31¼"x48¼"x50" 385 lbs. CRA-62 60 gal. Y 2 Manual 31¼"x31¼"x65" 363 lbs. CRA-6010 60 gal. Y 2 Self-Closing 31¼"x31¼"x65" 364 lbs. CRA-70 22 gal. - 2 Self-closing 35"x22"x35" 215 lbs. CRA-71 22 gal. - 2 Manual 35"x22"x35" 205 lbs. CRA-P04 4 gal. 1 Manual Closing 1 18" x 18" x 22" 35 lbs. CRA-P22 22 gal. 2 Manual Closing 2 35" x 22" x 36" 95 lbs. CRA-P44 44 gal. 4 Manual Closing 8 35" x 22" x 65" 130 lbs. CRA-P04W 4 gal. 1 Manual Closing 1 18" x 18" x 22" 35 lbs. CRA-P22W 22 gal. 2 Manual Closing 2 35" x 22" x 36" 95 lbs. CRA-P44W 44 gal. 4 Manual Closing 8 35" x 22" x 65" 130 lbs.